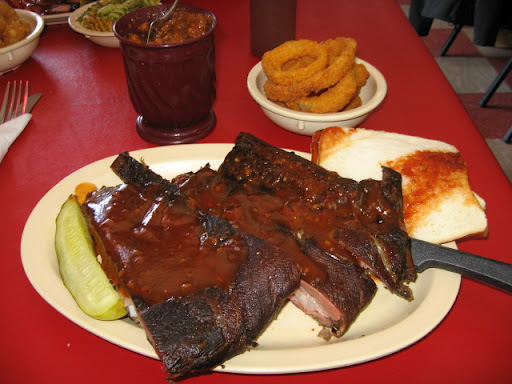 Lately, when a person thinks of western Wyandotte County, Cabela’s, Nebraska Furniture Mart, the Legends shopping center, and the Kansas Speedway are the first things that come to mind, but if you slightly venture off the beaten path in that area, some very good barbeque awaits. In my latest quest for all things pork, I hit up a place I’ve visited a few times before, and was always impressed with. 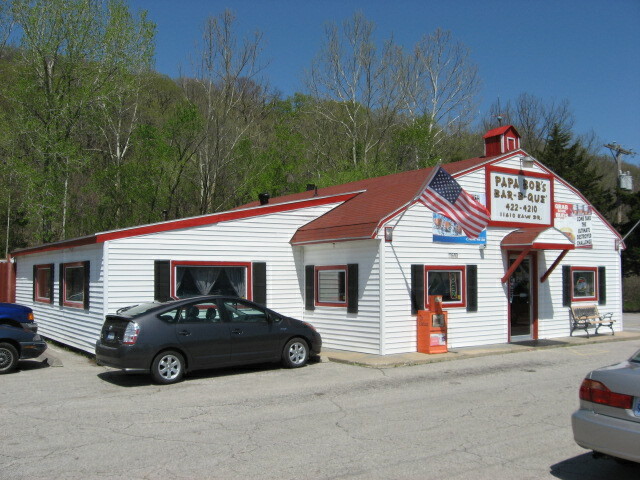 The place, “Papa Bob’s Bar-Be-Que”, is located on the eastern outskirts of Bonner Springs on KS Hwy 32. That’s just east of the KS Hwy 7 interchange, or about 15 minutes southwest of the Legends shopping area. Papa Bob’s is a neat little place that’s home to some excellent Kansas City Style Barbeque, as well as a nearly impossible food challenge that has stumped even the great Adam Richman of Travel Channel’s show “Man vs. Food”. On my most recent stop at Papa Bob’s, I had the “Rib Platter”, which consisted of an assortment of both long end and short end pork ribs, and the choice of 2 sides. The ribs were delicious; end of story! They were lean, tender, juicy and of course, smoky. They were cooked to near perfection and had just a light coating of Papa Bob’s regular BBQ sauce on them, which tasted great. The beans were meaty and tasty, the onion rings were crispy and fresh, and the meal was certainly more than enough food for me! Note the adult sunglasses and how small they look. If that doesn’t suit you though, they have an awesome food challenge for anyone brave enough to try it. It’s called “The Ultimate Destroyer” and it doesn’t appear on the menu. 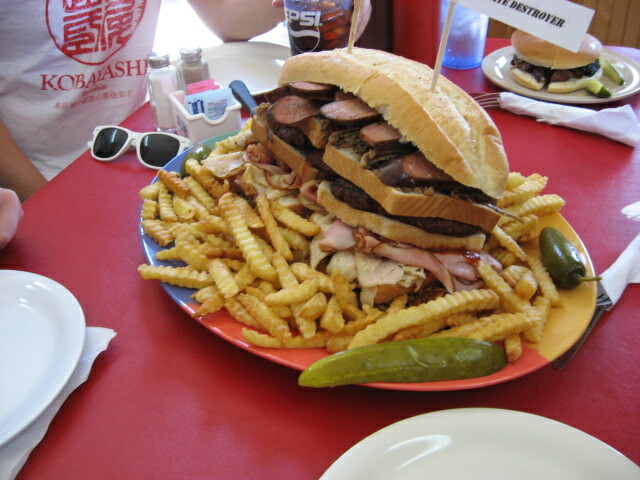 The Ultimate Destroyer is 4.5 lbs of meat on a 12 inch hoagie bun, served with 1.5 lbs of fries, and a pickle. It costs almost 50 bucks and you have 45 minutes to eat everything on the plate. Your prize for finishing it, besides basic pride, is that you get it free and you get to join all of about 4 people on the “wall of fame” that have actually finished it in as a solo act! If you fail, you get proudly displayed on the “wall of shame” instead! The day I stopped in to eat, I was lucky enough to see the sandwich with my own eyes. Unfortunately, it was a group of 3 adult men eating it, so the drama was limited. Nevertheless, the sandwich was a sight to see! Overall I highly recommend this place for its pork perfection. There’s not much I like better than a place off the beaten path that truly looks the part of the classic KC BBQ joint, and then backs up the looks by actually serving authentic KC Style BBQ. Throw in a ridiculous food challenge and an old-school indoor atmosphere and you have a can’t-miss place to eat if you’re near the Legends region and are looking for something besides the usual suspects of the restaurant world! Next on the agenda is something that we’ve both been waiting on. Remember how we said we would work with the Kansas Pork Producers to provide you with a summer grill giveaway? It’s here! Just give the picture below a click and get signed up between today and June 15 for your chance to win a Weber Genesis e-320 Gas Grill . Oh, and by the way, make sure to tell a pork producer thank you the next time you see him!